Aloo ka halwa or potato halwa is an unusual dessert. If you are making it for the first time, you will be surprised that how good it tastes. If you roast it really well, it will not give a potato taste but some unique taste. Try it and be ready for surprise! 1. Mash the boiled potatoes while still warm. Heat ghee in a kadhai/ wok. Add mashed potato and roast on a low heat. 2. Keep stirring the halwa as it tends to stick to the bottom. Roast for 10-15 minutes. 3. Add milk and sugar. Again keep roasting till sugar dissolves and halwa thickens to desired consistency. Turn off the heat. 4. 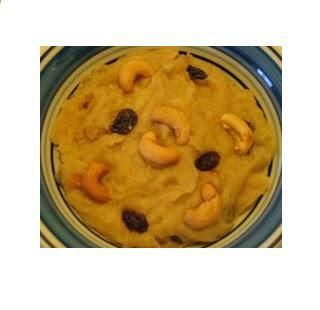 Add elaichi powder and garnish potato halwa with toasted nuts. Note- The more you roast the aloo ka halwa, the better it will taste. Take medium sized potatoes for this halwa.